Telly monster is my favourite character on Sesame Street, and a few years ago I was lucky enough to actually meet him. 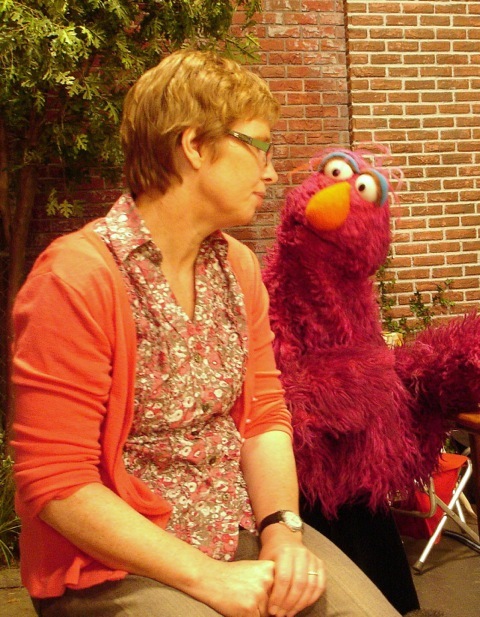 This morning I was delighted to find out from my resident Sesame Street expert that Telly monster is a triangle lover. I too am becoming a triangle lover. I have learned recently about the triangular distribution. For some reason it is in the New Zealand curriculum and I wondered why, never having used it or seen it in any statistics textbook. I still don’t know the official motivation for including it, but it is a really good idea. The triangular distribution seems to be a useful teaching tool. I say “seems to be” as I haven’t actually used it in a class, but I can see the potential for some very good exercises and learning experiences. There are three aspects of the triangular distribution that I find appealing. Using the triangular distribution alongside the normal distribution encourages the idea that the distributions are models of a real-life process. Like many curricula, the previous NZ curriculum included binomial, Poisson and normal distributions. Any questions of what model to use in a specific scenario were determined pretty much by the form of the story. If the story involved continuous data it pretty much had to be “normally distributed”. This could imbed a false impression that all continuous data was appropriately modelled by the normal distribution. A nice learning experience is to take some real data such as weights of lemons from a tree, and see how well that is modelled by a normal distribution. This can be enriched by also modelling this as a triangular distribution and seeing how well the two compare. A further extension would be to use a uniform distribution model of the same data. The beauty of this exercise is that it reinforces the idea that a distribution is a model of reality, and that there are different models that may be more or less appropriate for different data and circumstances. I find contrasts are helpful for teaching. The triangular distribution provides a nice contrast with the normal distribution in a number of ways. First is the requirements for specification. The triangular distribution is specified by the maximum, minimum and peak values. When we are making a subjective estimate, such as for completion time for a task, these are three easily pictured amounts – the longest time, the shortest time, and the most likely time for completion. This compares with the normal distribution, for which we need the mean and standard deviation, which would often be drawn from a sample. The triangular distribution has a finite range, bounded by the maximum and minimum values. In a triangular distribution we can specify, for instance, that the results of a test will lie between 0 and 10. Modelling such a situation with a normal distribution can give results outside the range, as it theoretically goes to infinity in both directions. The triangular distribution is not symmetric. It can be, but it is not a requirement. Where we have severely skewed data, it may well be that the triangular distribution is a better model than the normal distribution. This helps us when teaching the use of the normal distribution. The contrast is helpful. The idea that the probability of a continuous distribution is the area under the probability mass function is a difficult one for many students to get their heads around. One way to teach this is to start with a discrete distribution and then cut it up into finer and finer points. But then finding the actual area is problematic. With the normal distribution, the computation is hidden in the calculator, spreadsheet or tables. With the uniform distribution, the computation is trivial and can seem contrived. But areas under the graph in the triangular distribution can be calculated, and the exercise is not trivial. It also very nicely shows how the pdf is not going to give them the probability of a single value. So there you have it – three important lessons in one tidy little triangle-shaped package. And to help you use the triangular distribution in your teaching, we have this handout: Notes on Triangle Distributions which you are welcome to use, so long as you leave our branding on it. And if you want your students to have some great practice exercises, they can always join our course! I came across the use of triangular distributions in the context of simulation for business planning, much as in your examples. E.g. Month1 cost between (min1) and (max1) with most likely around (mode1), Month2 cost between (min2) …. etc., for several months, and simulating to estimate the expected total cost. To add complexity you can make these as cost per day (instead of whole-of-month costs), then business modellers might allow additional triangular distributions for the amount of time required for the task each month, which can vary, or even allow a triangular distribution for the interest rates charged on borrowing. Any chance of a matching set of notes for the uniform distribution? I will email you with details on getting trial access to the site that has notes.